Knowles, Taylor & Knowles. East Liverpool, Ohio. Knowles, Taylor & Knowles (KT&K) was a pottery company in East Liverpool, Ohio from 1854 to 1931. The original owners were: Issac Knowles, John Taylor, (Issac's son-in-law) and Homer Knowles (Issac's son). 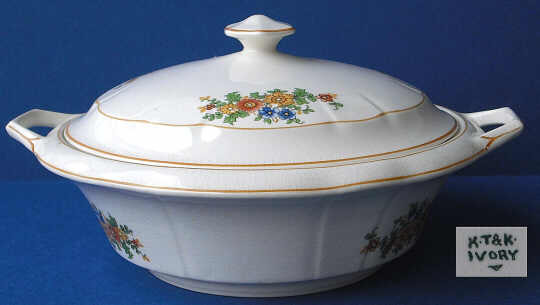 The pottery produced all types of wares from yellow ware, ironstone, and semi-vitreous dinnerware, but it is best known for the light-weight, translucent Lotus Ware. 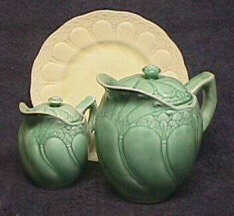 Produced mainly in the 1890s, Lotus was meant to compete with the successfull Belleek porcelain made in Ireland. High cost and breakage forced K&TK to halt production of Lotus. KT&K is not to be confused with Knowles China of Newell, WV. Even though Edwin M. Knowles of Knowles China was the son of Issac, the two companies operated independently of each other. In 1929, KT&K merged with several other potteries to form the American China Corporation, but the company folded due to the Great Depression. Top right: KT&K in East Liverpool, Ohio. Bottom right: KT&K advertisement from 1921. 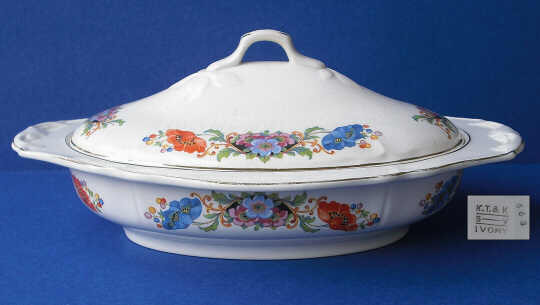 KT&K Covered Casseroles from the late 1920s/early 1930s. 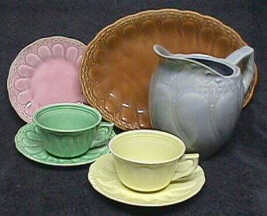 Solid colored dinneware made by KT&T in the late 1920s. Courtesy of Fran and Carl Stone Decaled KT&T plate, circa 1930. Ads for KT&T's decaled "Gloria" shape. 1925-1926 ad featuring the Coronado shape. KT&K's Coronado on display at the Museum of Ceramics in East Liverpool, Ohio. Left: TRANSCEDENT GENIUS IMMORTALIZED - Victory 21287 - An artistic conception, birds and flowers with natural embellishment, tastefully arranged and brought into relief by tan background make this decoration of unusal excellence. Right: White and Coin Gold - Used by our grandmothers -- will be used by our granddaughters. Old yet always new, and a recognized feature in social events. Our Victory shape strikingly lends itself to an ideal conception of this artistic decoration. Will make a notable addition to your line.